Question-1 :- Given a parallelogram ABCD. Complete each statement along with the definition or property used. Question-2 :- Consider the following parallelograms. Find the values of the unknowns x, y, z. (i) ∠D + ∠B = 180°? (ii) AB = DC = 8 cm, AD = 4 cm and BC = 4.4 cm? (iii) ∠A = 70° and ∠C = 65°? (i)It can be , but not always as you need to look for other criteria as well. (ii) In a parallelogram opposite sides are always equal, here AD BC, so its not a parallelogram. (iii) Here opposite angles are not equal, so it is not a parallelogram. Question-4 :- Draw a rough figure of a quadrilateral that is not a parallelogram but has exactly two opposite angles of equal measure. ABCD is a quadrilateral in which angles ∠ A = ∠ C = 110°. Therefore, it could be a kite. Question-5 :- The measures of two adjacent angles of a parallelogram are in the ratio 3 : 2. Find the measure of each of the angles of the parallelogram. Let two adjacent angles be  3x  and 2x. Since the adjacent angles in a parallelogram are supplementary. Question-6 :- Two adjacent angles of a parallelogram have equal measure. Find the measure of each of the angles of the parallelogram. Let each adjacent angle be x. So, each adjacent angle is 90°. Question-7 :- The adjacent figure HOPE is a parallelogram. Find the angle measures x, y and z. State the properties you use to find them. (i) As opposite sides are equal in a parallelogram. 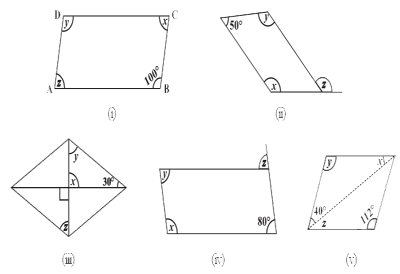 (ii) As you know diagonals bisect each other in a parallelogram. Question-10 :- Explain how this figure is a trapezium. Which of its two sides are parallel? NM and KL are parallel. So, KLMN is a trapezium. Question-11 :- Find m∠C in Figure if AB||DC .